Do you know the pilgrimage center Knock Shrine in Ireland? Did you know that it is a historical sanctuary in Ireland dated from 1879? Have you considered a trip to Knock Shrine, a pilgrimage center in Ireland? It is a very special place with a lot of history, with a museum and very well prepared to receive those who want to travel there and explore that holy place. Knock Shrine is a sanctuary (shrine) built in the Irish town of Knock. Its fascinating history is based on the Apparition of Our Lady, St. Joseph, St. John Evangelist, a Lamb and a cross on an altar of the Parish Church, on the 21st August 1879. There were fifteen witnesses to this Apparition, who watched for two hours in the pouring rain, the three Saints reciting the Rosary; and, besides, the witnesses were all saturated due to the rain, and not a single drop fell on the gable wall of the church where the vision was. After the Apparition, a Commission of Enquiry set up only for this purpose, interviewed all the fifteen official witnesses, aged between 5 and 74, and their findings were that all the testimonials were satisfactory and trustworthy. In Knock Shrine there is a museum, where visitors are invited to go back to 1879 and learn how life was at that time. One can also read about the amazing stories of pilgrims in the “Diary of Cures”, a collection of original letters from 1879-1880 written to Archdeacon Cavanagh. Pilgrimage in Knock Shrine: what to do? 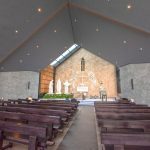 Each pilgrim should explore the holy place of Knock Shrine at their own pace and should do the sacred traditions as he or she feels it necessary. Nobody should feel obliged to do anything. You gave hope to your people in a time of distress and comforted them in sorrow. Remembering His promise, “Ask and you shall receive, seek and you shall find”. Pray for me now and at the end of my death. Amen.